The decision to access counselling usually emerges at a time in our lives when we are struggling to manage our emotions or thoughts. It can be hard to acknowledge that we are not coping as many of us feel that we should be able to cope with whatever life throws our way. We might believe that seeking professional help during the difficult times is somehow a sign of weakness. The idea of talking to a stranger about our most private feelings and thoughts can seem more frightening than struggling alone. Even though you may have the support of a loving family and friends, being heard by a person who is independent of the situation can really allow you to see your challenges from a different perspective. Talking to someone who is professionally trained, who is impartial, non-judgemental, caring and who respects confidentiality can help you to explore what is going on and can help you move to a less conflicted way of being. Recognising you do not need to struggle alone is a strength. Sharing your burdens and accepting support can facilitate a better, calmer future for you and your loved ones. Safe Haven can offer the calm, reflective environment where you can share your concerns in a private, non-judgemental space. If you would like to know more about the service provided please feel free to get in contact. 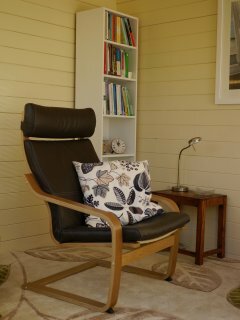 Safe Haven counselling is based in a purpose-built space in the garden of 80 Barnston road. We are located close to Junction 3 of the M53 with off-road parking.